UPDATE: Our twins are almost 4 years old, and this gate is still going strong (and with the addition of a third child as well). So, this has stood the test of time... or at least the test of 3 years. 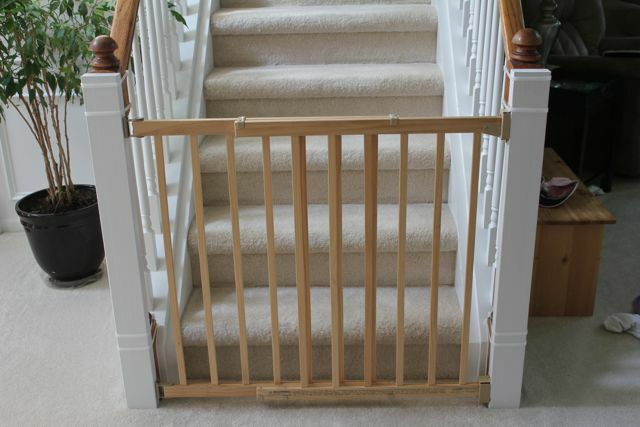 Now that our twins are crawling, we have become past due to install our baby gates. Over the past week, we finally decided to go for it. So here is a little tutorial on how we did this without drilling into our banisters. You can purchase kits to do this, but they're pretty expensive and unnecessary, in my opinion. This is an easy do-it-yourself solution. First of all, some information on our gates. We got some great gates from our friends who no longer needed them - Evenflo Top of Stair gate. I like the way the latch works, and you can open and close it with one hand and it is virtually silent (which is great for sleeping babies). They are also completely removable (in that you can detach the gate from the hinges and put it away if you don't need it for some period of time). This is useful for us, because the babies can't climb the stairs yet. Once they learn to climb the steps, we can just pop the gate on, and we're ready to go. We have a banister on either side with a very irregularly shaped bottom section (lots of different thicknesses of wood meeting). I really didn't want to drill into the banister. Even though you could fill the holes someday with wood putty, you would definitely be able to see where the gate had been. So we decided to go for a heavy duty zip tie solution. They are 2 feet long, and they are rated for 175 pounds each. I figure with 4 of these securing each of our 2x4s, surely the babies will not be able to pull these off (unless they can pull with 700 lbs of force). Miles is strong, but he's not that strong. Notice the cat, who is not excited about an additional barrier to escaping up the stairs. Not bad, but I know that these will be up for quite a while, so I decided to paint them white. After a couple coats of white semi-gloss, they looked much better. 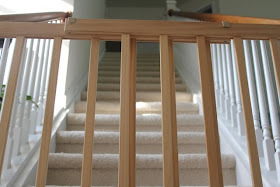 We attached the boards to the banisters using 4 zip ties on each of them (2 at the top and 2 at the bottom). We pulled these ties very tight. 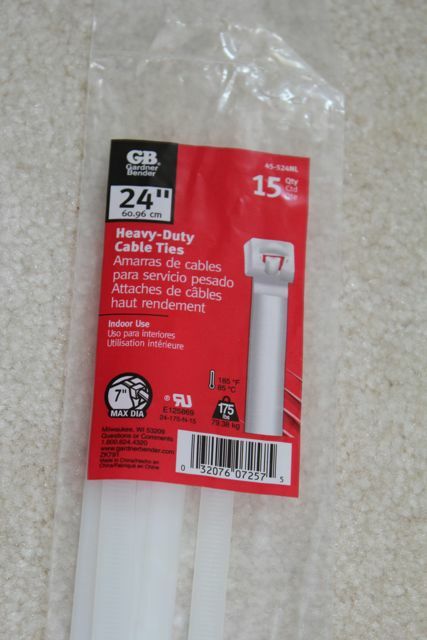 It's imperative that these ties be as tight as you can get them so that the 2x4 pieces can't move. Then, Jason installed the brackets directly onto the 2 x 4s. Vivienne is ensuring that he is installing the gates correctly. It doesn't look bad at all. In fact, I would almost go as far as to say that this looks pretty. =) We didn't have to drill a single hold into our existing structure, and it was an extremely easy task. The entire project cost us less than $10 (for the wood and the zip ties), because we got the gate for free (thanks, Eddie and Rhonda!). And, finally, here is a baby's-eye view. "I can dream of walking up these stairs unhindered someday. Someday..."
very nice! Some friends of ours did the same thing with their banister - zip ties, wood, then the gate. It's a great idea. I think that you can completely remove the gate but leave the hinges intact for an adult event (unless you need to keep the riff raff from going upstairs during a party). Does it open by sliding back on itself, or swinging? um, can i say how much i love that y'all are 5 months ahead of us?! figuring out all of this for us so we don't have to? lolol ... GREAT tip leslie!! Thanks! Lynn, it slides back on itself and then it swings open. You couldn't open it enough just by having it slide in on itself, so it has to swing open, too. I hope that makes sense. We did this too, but didn't think of painting the wood - great idea! It looks really nice! Initially we put in a top gate while I was prego to train the dogs to stay downstairs (poor babies) and didn't realize how quickly we'd need the bottom gate once Hudson started crawling. You may be surprised how quickly you'll need to use it! They figure out stairs too fast! Thanks a million...saved our lives with your baby gate solution. Thanks for the great tip! We did it with Velcro instead of tiewraps to reduce the damage tothe posts. You realize babies learn to undo Velcro long before it's safe for them to do stairs, right? Its a great idea. 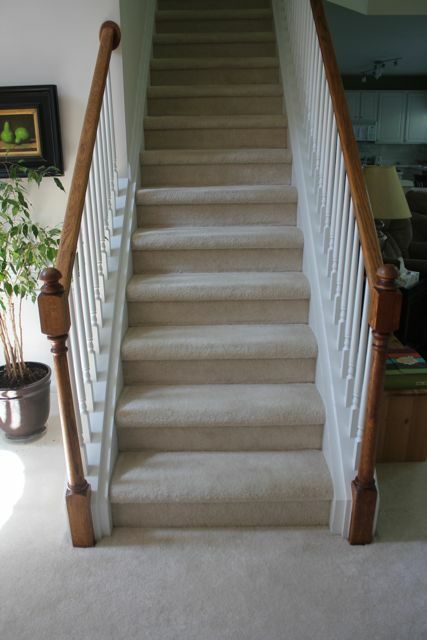 The shape of our stairs in my home is one side banisters (to the right). The other side is the wall. I'm trying to find a solution. Any idea will be welcome. 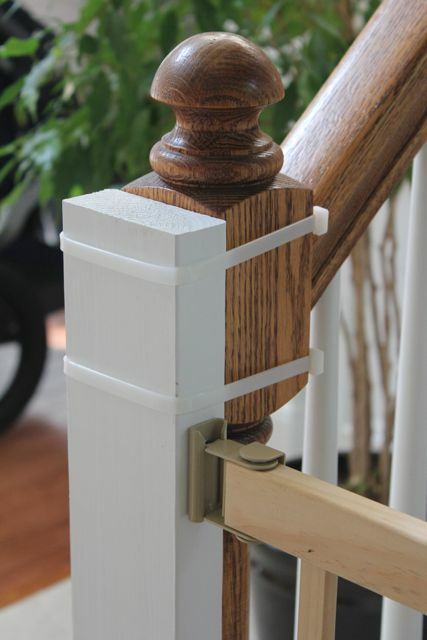 I was thinking to do the same (attaching the board to the one side banister), and having a simple gate, like the pressure mounted ones. We have the same issue. One side banister, otherside wall... any ideas???? If the other side is a wall, I think you're out of luck (if you don't want to drill into the wall). Personally, I would just drill into the wall. Drywall is easy to fix. At the top of our stairs, we affixed some thin strips of wood to the drywall using wall anchors (because there wasn't a stud in the right place), and then we screwed the gate bracket to that. Hope that makes sense! There are some types that only attach on one side and are pressure based on the other. The daycare I used to work for had them, I don't remember the band though, sorry. Using the method outlined above, we'll be able to screw one side into the 2x4 and use pressure on the wall. Great idea with the wood. My only concern is damaging the square wood posts when one has to pull the zip ties tight. saw this just in time! thanks!! Just came across this post on Pinterest. Very clever! Thanks for sharing. Thank you for reminding me of such a wonderful time of life (He's seven now!). Enjoy every minute - the time goes incredibly fast when the calender marks the events in his life and not just mommy and daddy's any more. how did you pull the zip ties so tight?? We just hand tightened them, but they are very tight. Our twins are now 2.5 years old, and we have added a third child, and the gate is still very secure. You are my hero of the week. Thank you so much! We've always just had an older kid teach the younger kid how to navigate the stairs, which you would not think would work, but it has! 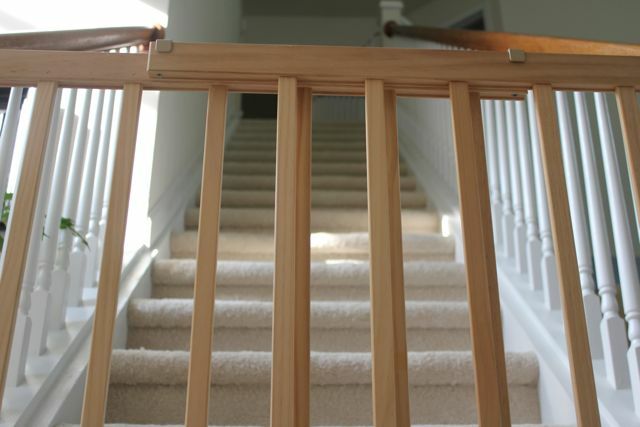 We've had a number of houses where the bottom of the stair was so wide, a baby gate simply could not be installed, so that was our solution...teach the baby how to safely crawl up and down the stairs! It worked do well with the older kids that by the time we had a house we could install a baby gate, we simply saved the money and the older kids once again taught the baby how to do it. Just my opinion,but having a child teach a younger sibling to go up/down stairs isn't very safe, the baby could easily still fall down the stairs,a lot of responsibility for a child so young to have!! 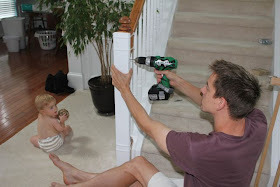 Installing baby gate without drilling banister, i very good idea. And thanks share this idea with us. thanks for the awesome tip! We're house-sitting for my parents and I hated the idea of drilling into their bannister, but I almost didn't see a way around it! Thanks!!!! Thanks! We recently bought a house with drywall on one side, bannister on the other. We drilled into the drywall and installed the gate part there, but used this for the banister side. We put heavy duty foam under the zip ties to further protect the wood from the zip ties digging into it. Not as pretty as yours, but it's only for a few years! This is great! We already have the same gates you have. We used them at our old house where we had wall on both sides at the top & bottom of the stairs. Our new house has 2 banisters at the bottom & wall/bannister at the top. 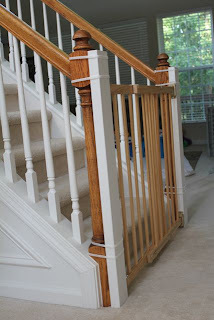 BUT, I just checked the bannisters & they are not square at the top and bottom...need to modify this great solution. Baby #3 is on the cusp of crawling....must figure this out shortly! Thanks! Thanks so much for this post! I referenced you in my post about our baby proofing adventures! http://spotofteadesigns.com/2014/02/baby-proofing-installing-the-gate/ Sorry forgot the link! This is a great idea and we borrowed it. we handmade our gate to match the railings. We have a one sided banister with a wall on the opposite side. For those asking how to attach to the wall without holes....we put up a board with 3m command velcro picture hanging strips. works perfectly. (that is the side the gate closes and locks). 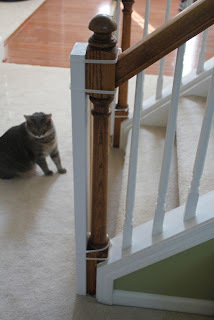 We did use the zip ties on the banister side. However, we had to put two together in order to get one around the banister. Then we trimmed the extra off. The problem...when you cut them, what is left is a very sharp edge. we kept getting scratched if we bumped it. so right now the gate is down until we figure out what next. 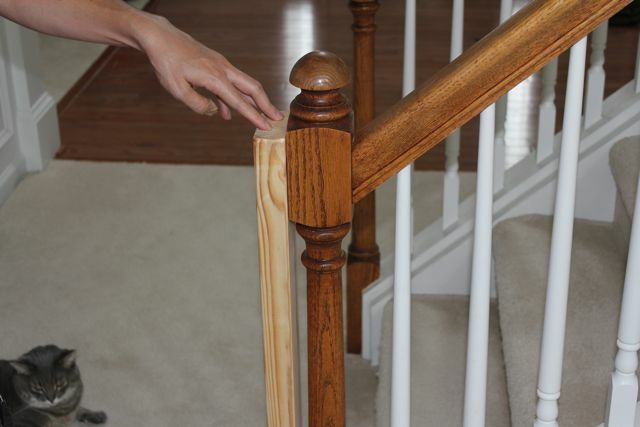 we dont want to put holes in the banister. Any ideas? Sand it with a piece of sandpaper until it is smooth - sandpaper works great on hard plastics like this. Question... How easily does your Evenflo Top of The Stairs Gate detach from your hinges in the walls? I have been thinking about purchasing just one gate, but (if possible) purchasing another set of hinges to install at the bottom of the stairs as well. I figure if I am upstairs and decide to go downstairs with my little one, I could just detach the gate and move it to the hinges located downstairs? I hope that makes sense. If it is a pain and requires a lot of work to detach, I think I will try to go another route... Any Thoughts? It is very, very easy to remove the gate at the hinges. If you watch the video linked at the very top, I actually show you how the gate comes off the hinges. It's a very simple, functional design. Great! Thank you for directing me to the video (failed to see that at the top of the page (; ) and for all the time, headaches and money you just helped me save!! Great tutorial and product! Bonus Trivia: The end post is actually called a newel, the banister is either the handrail itself or the entire structure of the handrail plus balustrade. If someone want to read more about those slide gate openers I think this is the right place for you! Need help!! 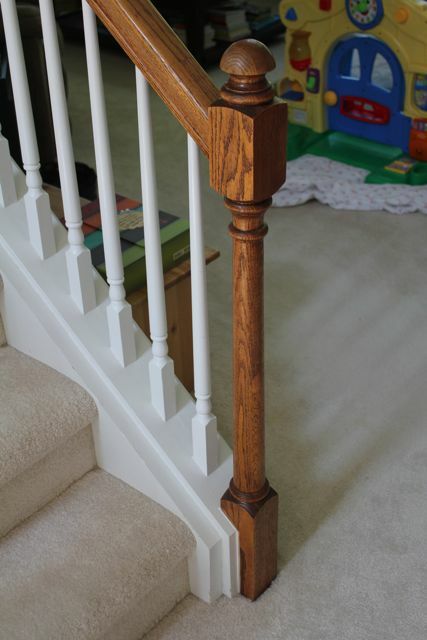 We nee to put up a baby gate on bottom of our staircase. Problem is one side is wall and the other is a railing. We do not want to drill holes in either so what are our options?? RINOX Engineering - Asia's biggest factory producing Stainless Steel Handrail and Glass Hardware. RINOX products are sold in more than 65 countries across the world. RINOX produces a wide range of Premium Handrail accessories and Architectural Hardware including Glass Clamps, Elbows, Canopy systems, Bar Holders, End Caps and thousands of articles for Balustrades, Railings, Patch fittings, Glass door handles, door closer, floor hinges and many more. Your article is a great guide. We have recently made a resource for baby proofing almost anything around the home, please take a look at it below. Perhaps it's worth mentioning in the article? This article is great. Thank you admin.